Found only in the southern Kruger National Park, at two game parks in the northeastern area of KwaZulu-Natal, in an Eastern Province game park, and in a game park of the North West Province. Don't mess with this guy. His temper and nerve let it seem as if he has slept in the thorn bushes last night. While his nephew, the white rhino, has a square mouth (and is bigger in size), the black rhino has a round mouth (or a hook lip). This rhino's eyesight is as bad as his temper‚ he is short sighted, but his rounded, receptive ears and good smell seems to fill in what might be lacking in sight.The black rhino may seem quite timid and slow, but, if provoked, his ill-temperateness will quickly show: seconds later he might leave behind a new way of broken bush in his dangerous charge, ended in fierce snorting as if to say his ready for more action. His motto seems to be first fight, then ask questions. Tourist are well advised to keep the distance. 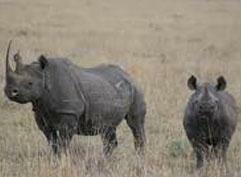 The black rhino's horn can reach almost 50 inches.